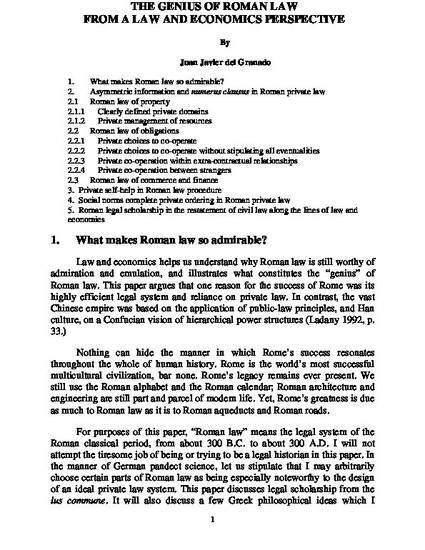 Law and economics aids us in understanding why Roman law is still worthy of admiration and emulation. The admirable character of Roman law is its quality as an (almost) paradigmatic private law system. My discussion of Roman law illustrates how private law can align incentives for people to exert efforts to optimize investment and share information so as to reduce information asymmetries. Roman private law also enables people who face resource, incentive, and information constraints to act more consistently in their own interest and, when efficient, to act in the interest of others, which is a key aspect of eliminating the need for public law intervention. This paper shows how Roman private law makes possible a decentralized market without mediation by public law. The private sector cannot exist in a vacuum. Private law enables the private sector to be the main driver of the economy. Understanding how a system of private law works is relevant for economic liberalization in Latin America and the Caribbean.